The World is Not Enough is a first-person shooter and the spiritual sequel to Goldeneye (1997, N64). 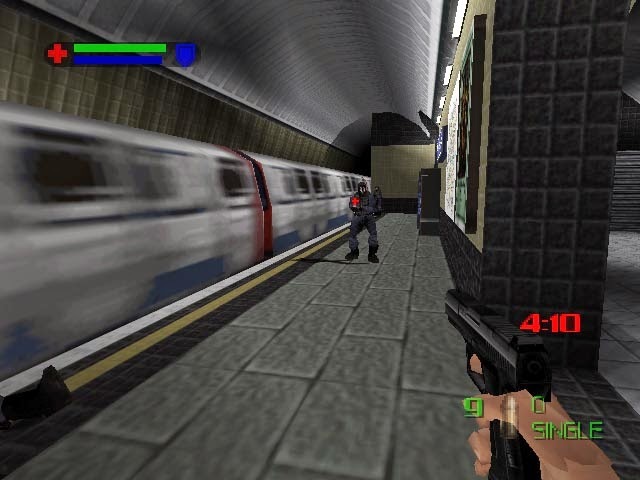 Comparisons to Goldeneye are inevitable as it features very similar gameplay and mission structure. However, it also shares similarities with Eurocom's later FPS called James Bond 007: Nightfire (2002, GameCube) due to it's heavy use of cut-scenes to advance the plot. On top of the usual FPS levels, Eurocom added lots of variety including stealth missions, underwater sections and a downhill snow area. In the latter you need to shoot enemies and destroy fuel dumps while on skis but the controls are difficult due to your constant movement downhill. Later in the game there are some annoying 'protect' missions with bad A.I., and vague objectives where you'll find yourself retrying the same levels over and over again. For example, Mission 8 is timed and once the bomb explodes you have to jump onto a random rail otherwise you die! Likewise, the same level ends with you entering a lift to escape an explosion; however, if you don't know to move to the very back of the elevator you fail the mission! By far the worst offender though is the final mission; basically, you have to swim around an underwater maze while your oxygen level constantly depletes. It's incredibly confusing and you will get lost while cursing at the godawful controls. It's a real shame as when the gameplay is purely an action based FPS it's a lot of fun and harkens back to the classic Goldeneye. Most of these levels are towards the start of the game and there's some great missions that take place in the London Underground and alongside the River Thames. If you enjoyed playing Goldeneye definitely give The World is Not Enough a chance as it certainly has its moments. The game's main flaw lies in its variety though and the action is at its best when it sticks to being a simple, straightforward FPS. Random trivia: The PlayStation version of this game was released around the same time but it was developed by Black Ops Entertainment. As a result, it features different missions and no multiplayer mode.